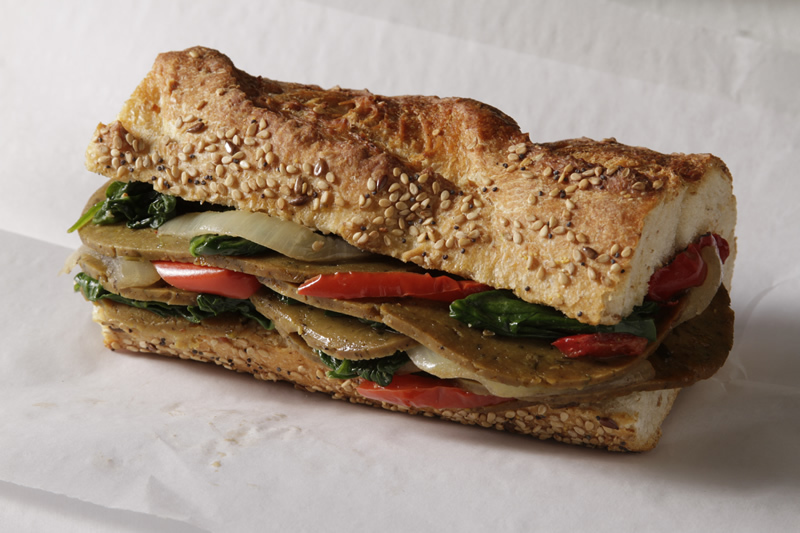 Looking for vegan and plant-based protein options for your menu? 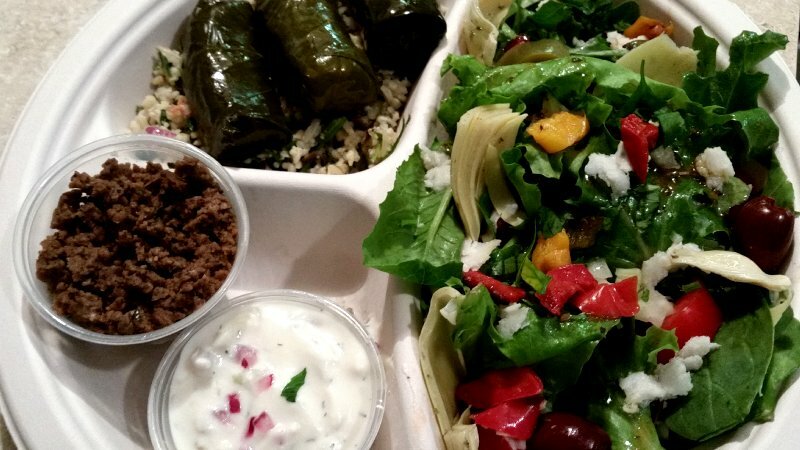 Eleni's Modern Mediterranean takes you there! 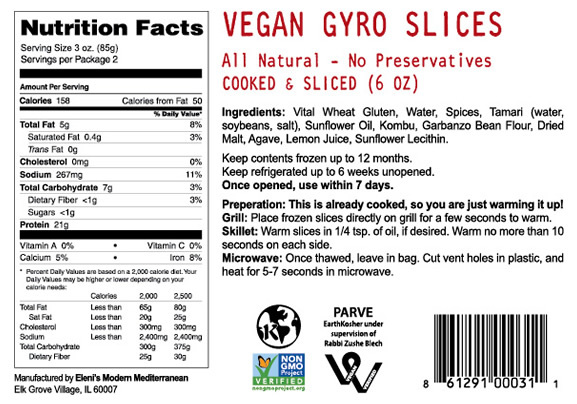 Introducing precooked, portioned, seasoned vegan gyro slices, sausage slices and authentically seasoned crumble. And now announcing our NEW Eleni’s Vegan Falafel! 21 grams of plant-based protein per 3 ounce serving! Add our proteins to spice up your existing options, or create quick new sensations in wraps, artisan dishes, salad bars and more. Introducing first to market offerings! 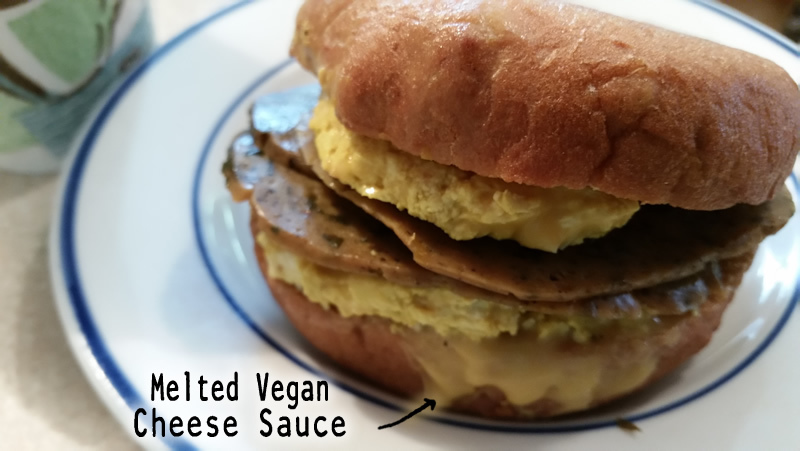 Breakfast vegan ‘egg’ scramble fully cooked, fluffy portioned/formed round or long sliced scrambled ‘eggs’ that fit easily in wraps, bagels or biscuits for instant morning choices. 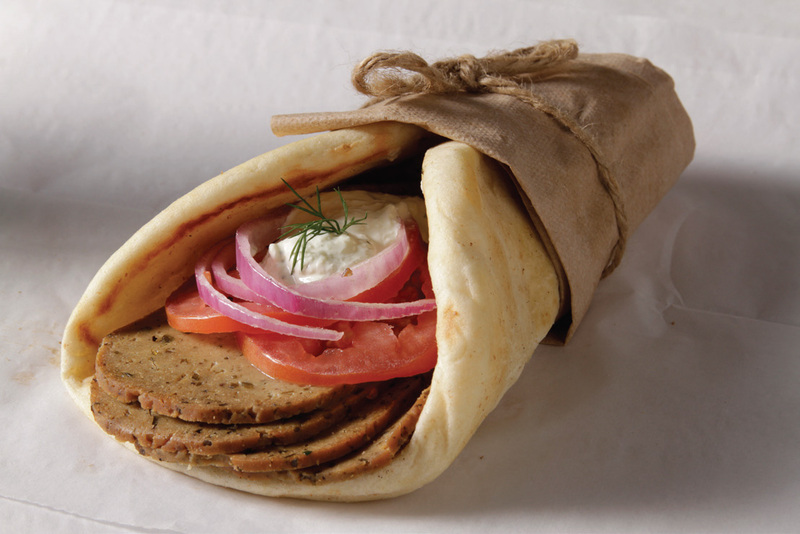 Add our gyro or sausage slices for a zero cholesterol, healthy, high-protein start with all you need to make food service fast. 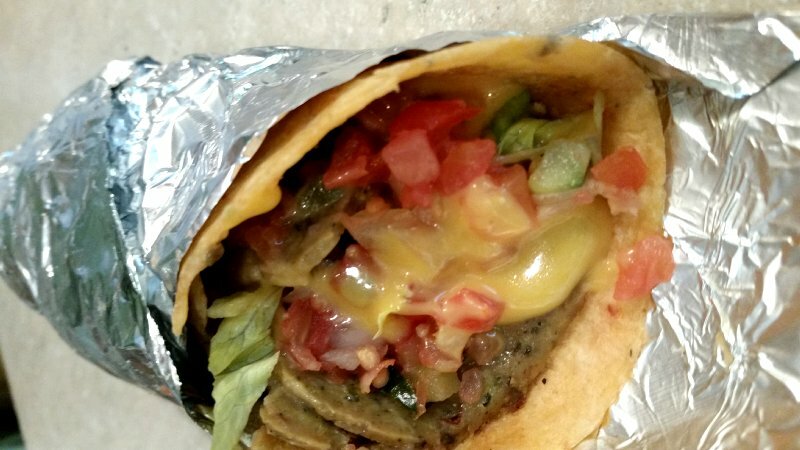 We make it so you don’t have to. FOH and BOH will all be raving! Add our vegan sides — delicious melted (gooey!) 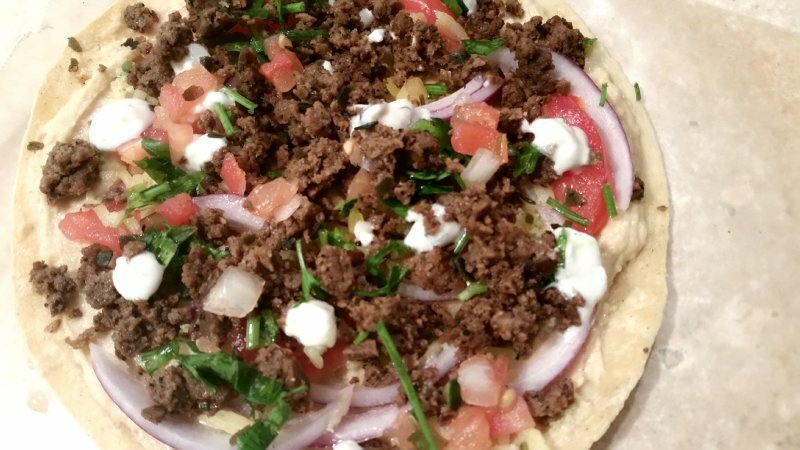 cheese spread, tangy tzatziki sauce or Mediterranean salsa — to our gyro slices, sausage slices or authentically seasoned crumble for your own unique menu creations. 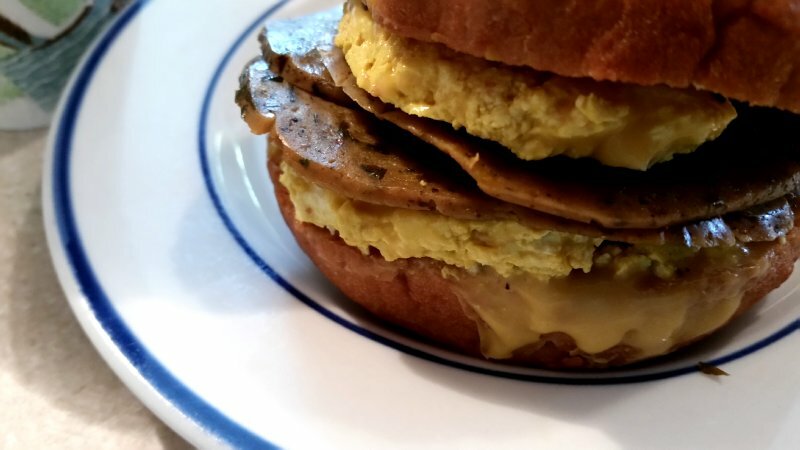 Consumers are asking for protein alternatives. Be on the leading edge to give them what they want. It isn’t difficult! 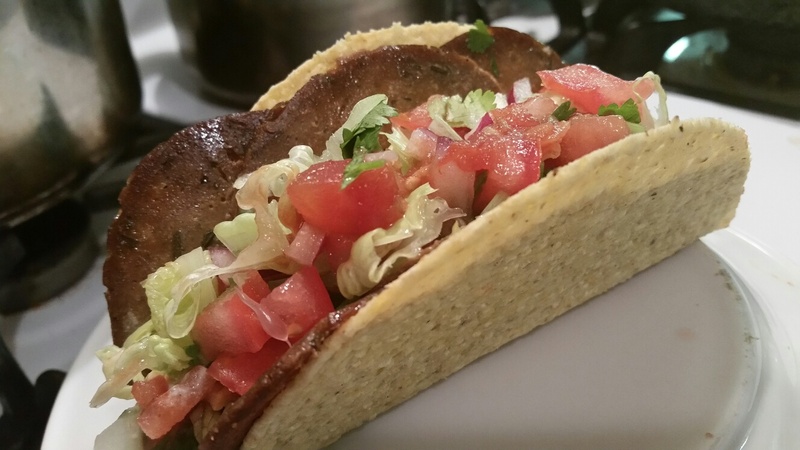 Our products are easy to incorporate into your existing menu dishes for a quick vegan meat alternative, like sausage or gyro slices in tacos. According to a report from Lux Research, meat and fish alternatives could claim up to 33% of the world’s protein market by 2054. Warm and GO... in seconds! 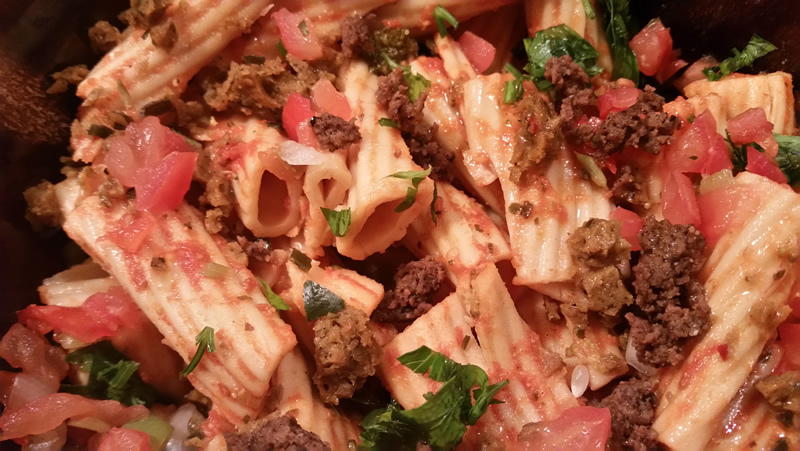 All of Eleni’s products are precooked and seasoned. 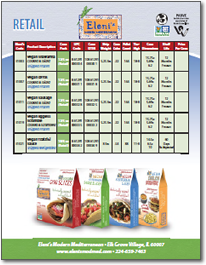 Add exciting new flavor profiles that are convenient and creative. 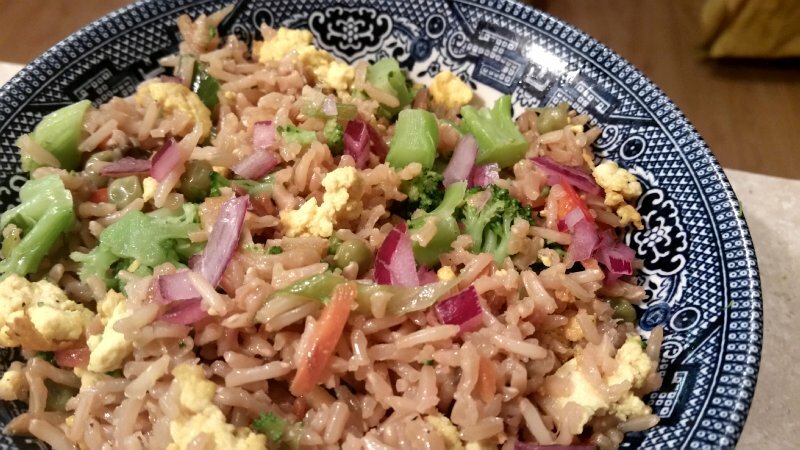 Now you can offer gluten free, vegan options, and those exciting hot breakfast menu items that healthy ethnic food lovers are searching for! 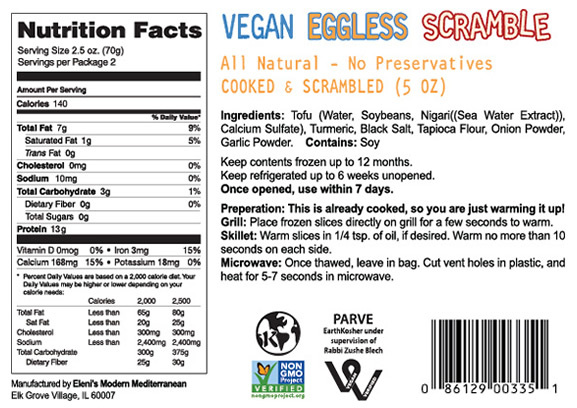 Delicious versatility expands your menu options! Our authentically seasoned proteins, sides and sauces can expand your menu offerings in unlimited ways! Create something new or use our products in your existing recipes to provide that vegan alternative that healthy eaters are clamoring for. The possibilities are endless! Now enjoy a zero-cholesterol vegan gyro or shawarma with all of the amazing taste you’re used to! 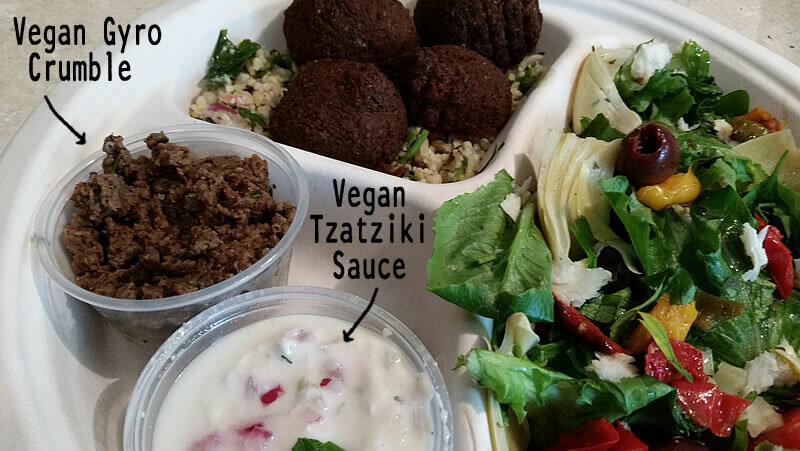 Use our vegan gyro in a sandwich with our creamy vegan tzatziki sauce, or add Eleni’s delicious vegan gyro crumble to complete your favorite salad. 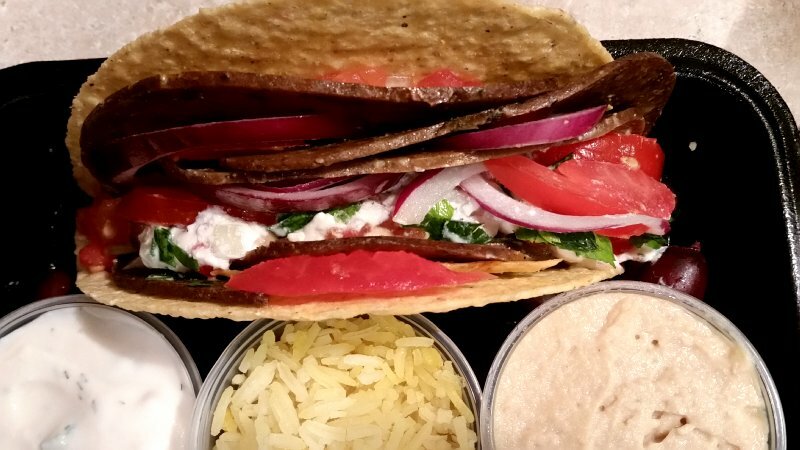 There are hundreds of creative ways to include perfectly pre-cooked and authentically-seasonsed vegan gyro and shawarma into your meals and menus! Available in slices, loaves and crumble. Create amazing unique cuisine in seconds, adding a modern twist to your standards, all packed with 21 grams of plant-based protein! 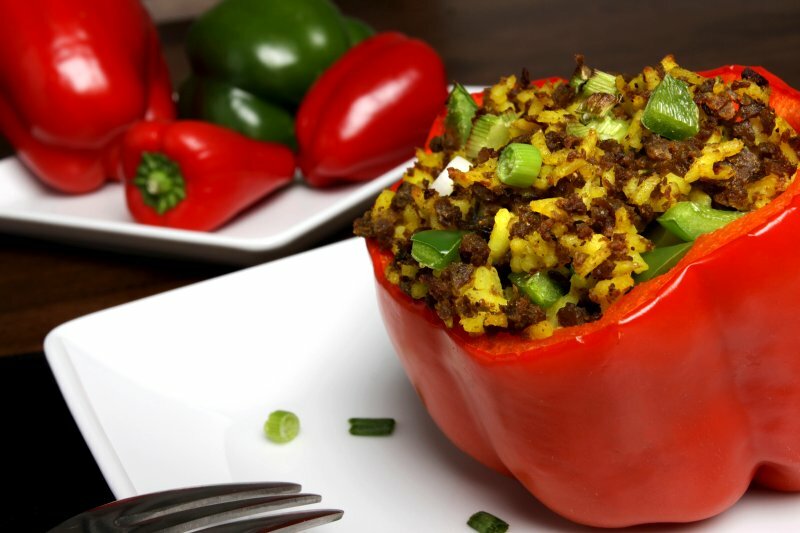 A Moroccan chili with fava beans, eggplant, veggies, crumbles of flavorful vegan meats, delicious. Our diverse serving suggestions include using our products in every traditional ethnic cuisine to encourage your culinary creativity. Send us your favorite results post on our Facebook page. Inspire us! We’d love to hear from you! 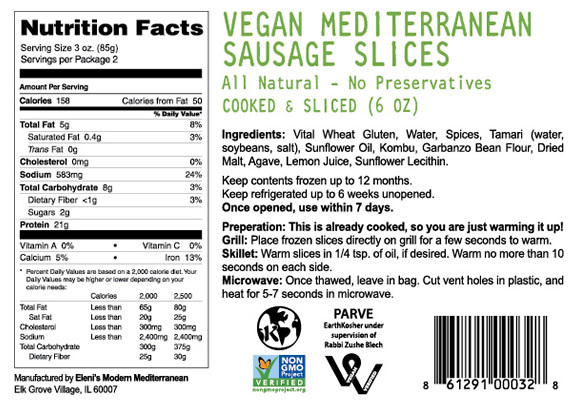 Our sausage product is made with the finest Italian blend of authentic seasonings. Add to pasta or pizza, or use whole slices in your favorite melt, such as a peppers and onion hero, or for breakfast in a muffin or bagel sandwich! Our versatile crumble can be used for authentic Italian dishes, including stuffed peppers, lasagna, manicotti, eggplant, meatballs or in any recipe where you might use ground sausage. Available in slices, loaves and crumble. 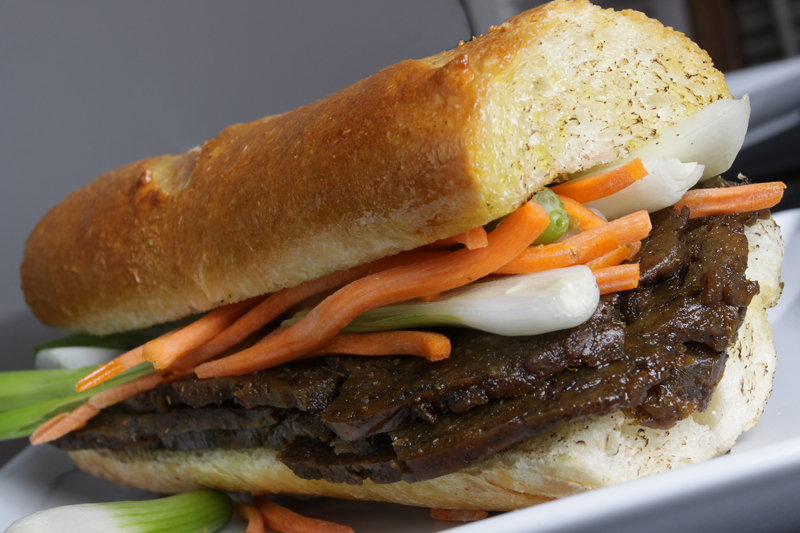 Our exciting and delicious new-to-market offerings can expand your menu offerings. What’s new? Just this! 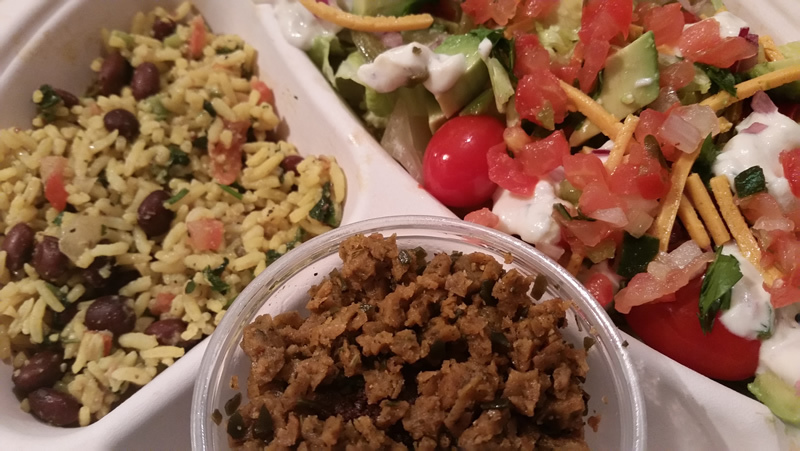 Ask about our wheat-free sides & sauces! NEW! 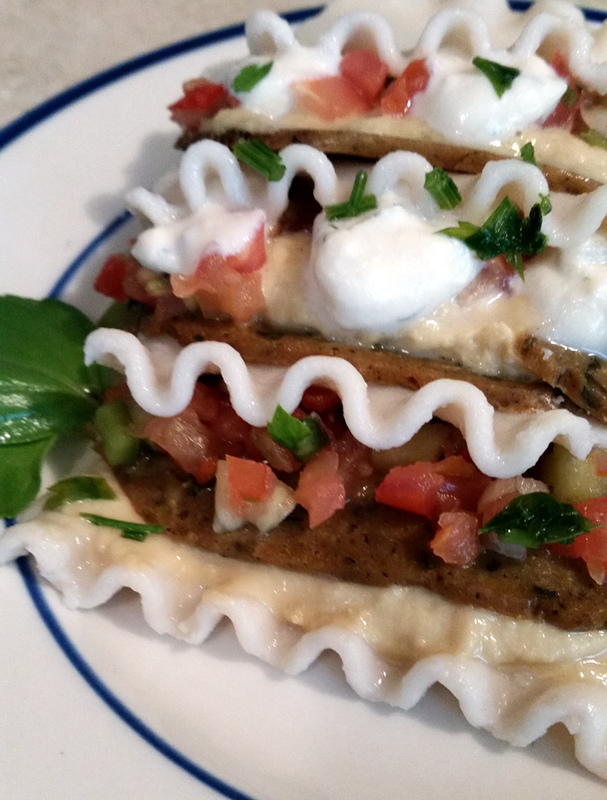 Introducing Eleni’s Vegan Falafel! We now have the best falafel in the world! Well, we think so. 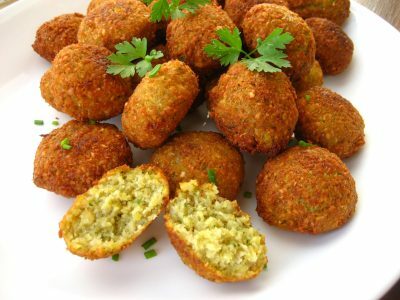 🙂 What makes them special is that Eleni’s Vegan Falafel are prepared for you using a unique natural proprietary process that, when reheated, are crispy on the outside while fluffy and full of flavor on the inside. 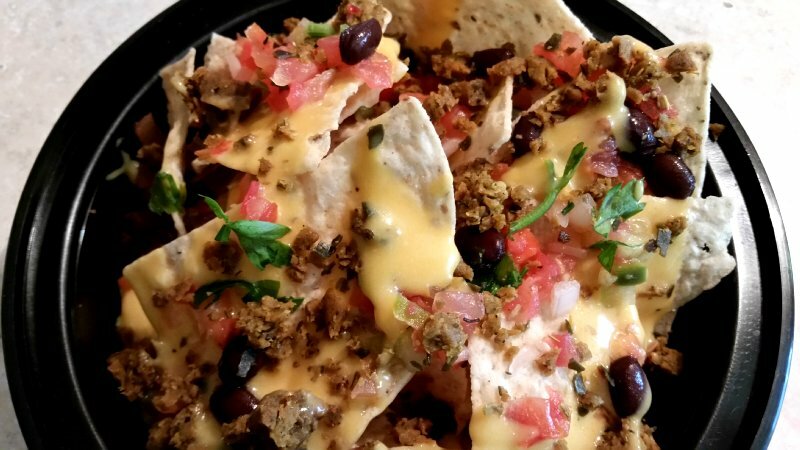 We use fresh beans, herbs and spices so the color is bright and flavorful. 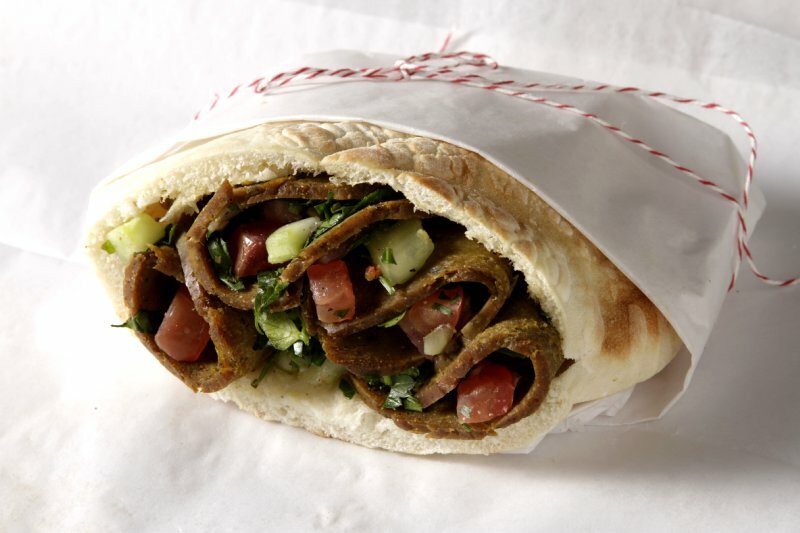 Eleni’s falafel come fully cooked and frozen, ready to rewarm in seconds, or as a fresh mix ready to make in house. 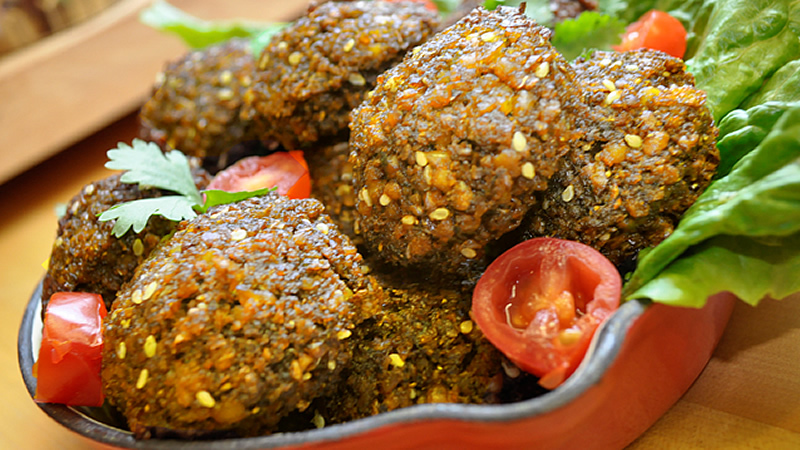 Our falafel are a great source of protein and fiber! 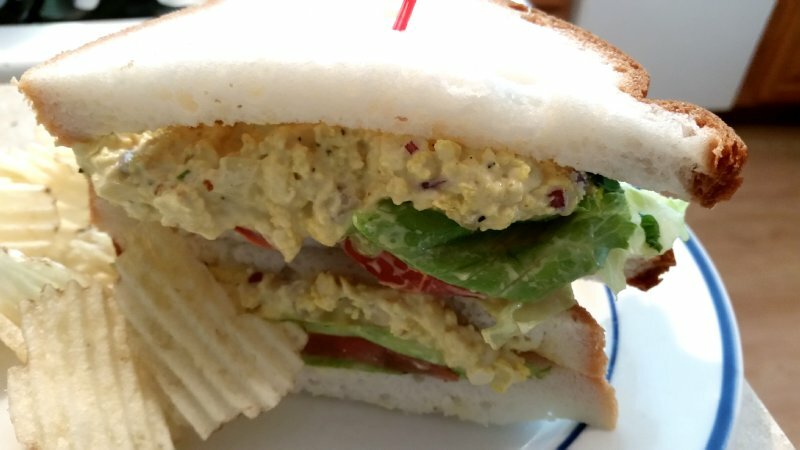 Pair with our vegan tzatziki and you have something super special. Available now for food service only, but retail coming soon! Retail customers, are you looking for our delicious products in your local store or on menus of local restaurants, schools or hospitals? As we continue to grow the distribution of our delicious vegan products country-wide, we will be showing up in a grocery store or on a menu near you soon! 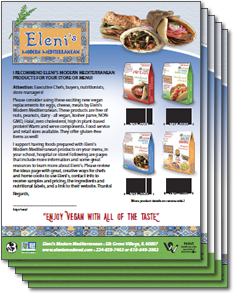 However, if you would like to see our vegan products at your favorite store or eating establishment sooner than later, feel free to download our “Recommend Eleni’s” packet to print out and take — or send electronically — to the manager of your favorite store, restaurant, school or hospital. Substitute in your favorite recipes! 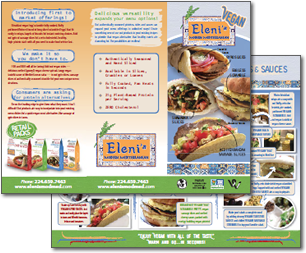 All of Eleni’s protein products can be used as meat substitutes in your favorite menu items. The possibilities are limitless! Our delicious and versatile meat-substitute products are all natural, contain no preservatives and have ZERO cholesterol. Available in slices, crumbles or loaves. 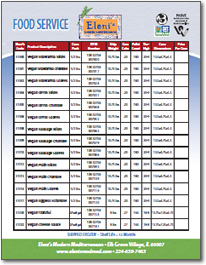 Executive Chefs, Buyers, Nutritionists and Store Managers: For complete details as to product type/cut, packaging sizes/servings and ordering information, you can download our sell sheets for both retail and food service. If you have questions or would like pricing for our delicious and versatile products, please contact us at 224.659.7463 or 630.992.1110, email us at info@elenismodmed.com, or use the form below. For quick offline reference, please take a moment to download our tri-fold brochure with interesting product details and ideas. 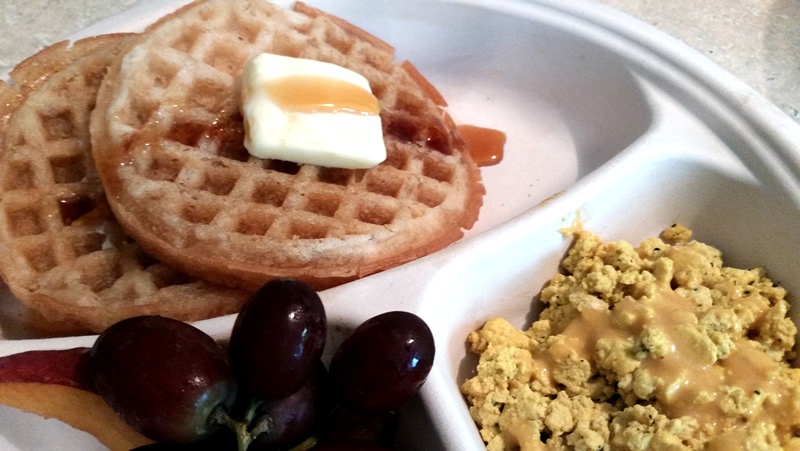 Be the first to get news & recipe ideas for our delicious products! Copyright © 2019 Eleni's Modern Mediterranean. All rights reserved. | Website design & development by Small Web Solutions.